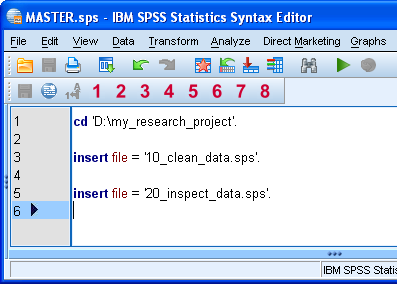 SPSS Insert is a command for running syntax files from within another syntax file. This may help keeping your syntax organized. SPSS Insert Command - Why Use It? Executing all of your commands from syntax may be the single best practice for working with SPSS. One of the reasons is that you can correct steps early in the process and then rerun them together with all subsequent steps. However, your syntax file may become rather lengthy when you're working on larger projects. This may require scrolling and searching through many lines before you'll find what you're looking for. A nice way to keep your syntax organized is to break it up into different files. However, in case you'd like to rerun your syntax (due to corrections or accidentally damaging your data) you probably don't want to rerun several different files separately. The solution is to create a master syntax file that runs the other syntax files for you. This is done with the INSERT command. SPSS Insert Command - How to Use it? First create the master syntax file. It's recommended you Change Your Working Directory here. Assuming all syntax files will reside in this folder, you can now just use their file names in any INSERT commands. Also, if you'd move the entire project to a different folder, you'd only have to modify a single CD command. Next, you may want to inspect your data. You can create a separate syntax file for this too, for instance "20_inspect_data.sps". Now you can rerun your syntax by using insert file = '10_clean_data.sps' as demonstrated by the screenshot. Before INSERT was introduced in SPSS version 13, similar functionality was provided by INCLUDE. However, using the latter is a bit more complicated and may now be considered deprecated.